I did a dotticure for Valentine’s Day so I made one for St. Patrick’s Day. 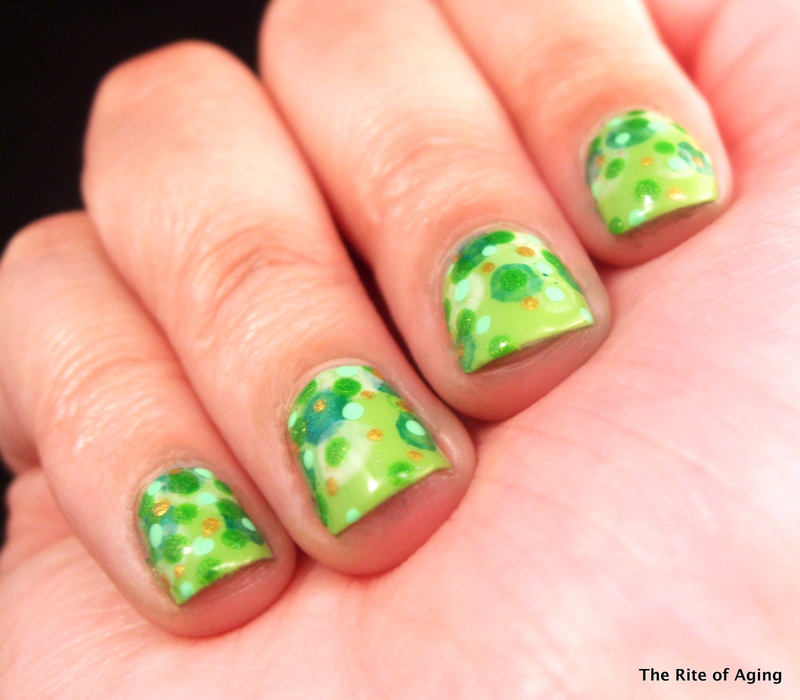 I am still on my green kick so I classified the nail arts under this holiday! Anyways, due to stress and fatigue I am beyond tired. I considered not painting my nails but I needed a pick-me-up and nail art perks me up. However, I am sort of flared up so I fell back on RA-friendly non-uniform dots. The picture is different as the usual lights are on the fritz. I pulled out my dusty light box and tried it out again. I now know how to set my camera more properly so I’m hoping I can get the hang of it. What do you think? Good picture or not? I have a lot of trouble focusing the details in the light box but I think that is due to insufficient lighting. However, my skin always looks so smooth! I guess there is a trade-off! I hope you like today’s nail art! I started with 2 coats of Sephora by OPI It’s Totally Karma as my base. I “nimbus-ed” with Zoya Giovanna and Pahlish Sunless Sea. I sealed the design with Seche Vite to create a semi-3D effect. I dotted with Cult Nails Deal with It and Color Club Twiggie. Your dots look great! Great palette and spacing – all in all wonderful! Thank you!! I just wish my photo had turned out a little better!